Your wedding day is supposed to be one of the most memorable days of your life and everything needs to be perfect. For the average couple, there are so many things to plan from the cake to the bride's and bridesmaids' dresses and the location. Along with this is the theme of your wedding and what you can do to make your wedding special and memorable. One of the latest and very popular ways to add a touch of fun and color to your wedding is to use wedding sparklers to light up the event. If this is the first time you have heard about wedding sparklers, you might be surprised to learn that they are very similar to the ones used to celebrate many other events throughout the year such as the 4th of July, Christmas, and New Year's Day. Essentially, most sparklers for sale are long wires covered in a substance that gives off sparkles of light once they are lit. These sparkles are relatively harmless as long as the sparkler is handled with care. One of the biggest differences between the sparklers used for other events and those made for weddings is the amount of time they burn. While shorter burning sparklers might be a lot of fun to wave around at night, they do not have much to offer when you are trying to give the bride and groom a send off they won't soon forget. We offer sparklers for sale that range in size from 10 to 36 inches long. Those that are 36-inches long will burn for approximately 3 - 5 minutes and feature easy-light tips to ensure everyone can participate in the fun. One of the best things about our sparklers is that they burn essentially smokelessly so your reception hall doesn't fill up with smoke. There are several ways you can use wedding sparklers to enhance your special day. 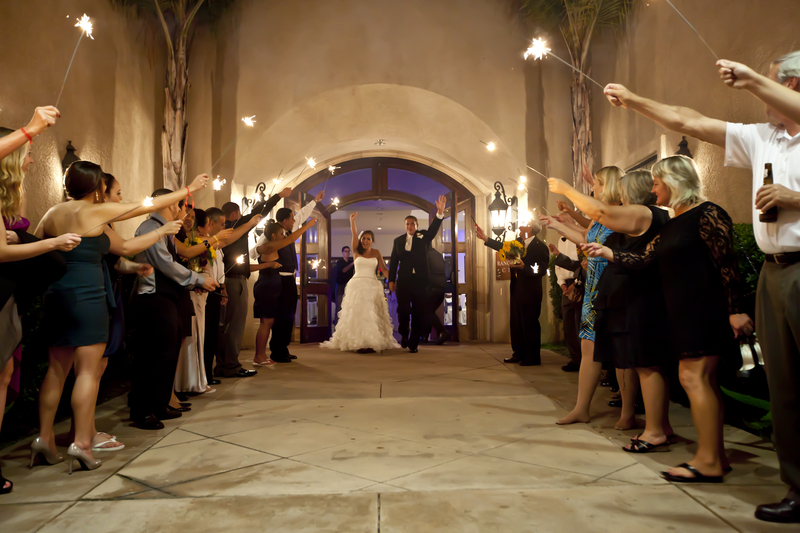 Some wedding parties have the guests form an arched passageway complete with burning sparklers lighting the way into the receptions. Long-burning sparklers give the bride and groom plenty of time to greet everyone on their way in. Others choose to form the passageway for the happy couple as they leave the reception and give them a beautifully lit exit. Standard 4th of July type sparklers simply do not last long enough; most burn for less than a minute. For the best possible results, you should buy 36-inch sparklers as they burn for far longer. One thing to keep in mind is that you should have as many people as possible practice the event to ensure that this important part of the ceremony goes off without a hitch. You should also have at least one bucket of water on hand to place the used sparklers in when everyone is finished. Long-burning wedding sparklers are a fantastic way to add an extra dash of pizzazz to your wedding. At Wedding Sparklers Outlet, you will find a wide range of sparklers to choose from, including special heart shaped sparklers for that added touch of romance. If you would like to learn more about our selection of long-lasting wedding sparklers, contact us here.